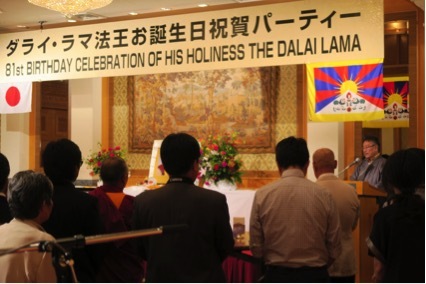 (TibetanReview.net, Jul06, 2016) – The 81st birthday of Tibet’s exiled spiritual leader, the Dalai Lama, was marked in Japan’s capital Tokyo on Jul 2 with a public reception attended by Japanese MPs and other public figures as well as guests and Tibetans. Mr Sonam Topgyal Khorlatsang, Kalon (Minister) for Department of Home of the Central Tibetan Administration, Dharamshala, India, was the chief guest. The venue was Hotel Okura. Those who attended the event included Mr Makino Seishu, founder of Japanese parliamentary group for Tibet and Chairman of Human Rights Foundation, and Koichi Hiraoka, executive director and principal of Seifu high school. The reception began with an offering of mendel before a portrait of the Dalai Lama by the chief guest, which was followed by a long life prayer offering by Tibetans in Japan. Earlier on Jul 2, Mr Khorlatsang gave public talk on the situation of Tibetan refugees in India and new arrivals from Tibet at the Keisho Den hall in Gokokuji Temple, Tokyo. The day before, Mr Korlatsang was reported to have met with Mr Watanabe Miki, an MP from the Liberal Democratic Party. He was also reported to have met in Osaka with Mr Hiraoka Hidenobu, Chairman of Seifu High School and to have given a talk to students on the topic “We must know what is happening in Tibet”.